Hugh Taft-Morales, leader of the Philadelphia Ethical Society, outside its office on Rittenhouse Square. This August will mark the 400th anniversary of the forcible relocation of about 20 Angolan captives to Point Comfort, today’s Fort Monroe, in Hampton, Va.
After an early system in which Africans worked alongside white indentured servants, Virginia enacted laws that stripped any rights from black people. In 1662, a system of lifetime chattel enslavement was established. 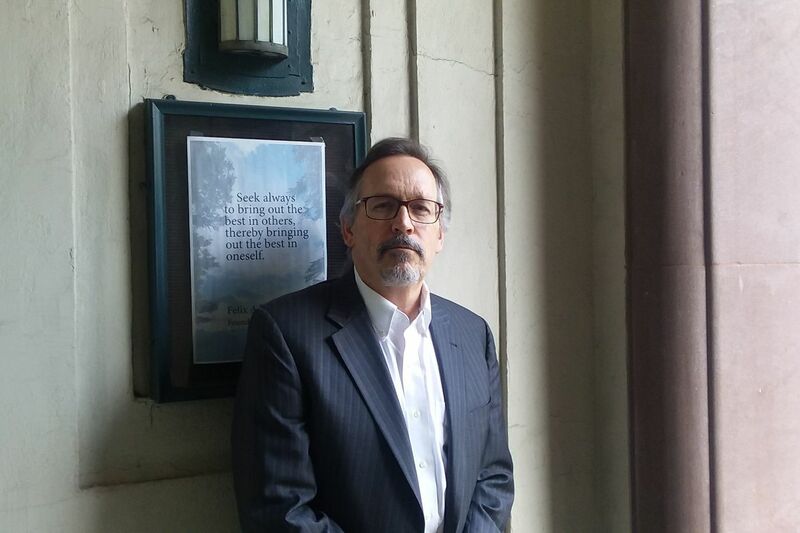 This January, Hugh Taft-Morales, leader of the Philadelphia Ethical Society, began a yearlong campaign, “The 400 Years Project.” He would offer 400 weekly words, 400 lessons, and a bibliography of 400 works, and would garner 400 commitments to confront systemic racism more directly from 400 people. Recently, The Inquirer talked with Taft-Morales about the project. Why did you decide to take on the 400 Years Project? I was involved in other work with the Ethical Society, where a big part of our commitment to social justice is anti-racism and anti-white supremacy. About four years ago, I saw that this anniversary was coming up, and I wanted to acknowledge it. … There are people who have not been involved in anti-racism work. They’ve been stuck because of their own sense of being unable to see how they fit into it. Often, the history shows how we all fit into it, whether we want to admit it or not. People will say, ‘My family didn’t own slaves,’ but they’re living in a world where contemporary problems are pointing out that these roots go way back and way deep. Why is telling this history important? I’ve been a teacher for most of my life, and this is a continuation of that. The overwhelming part of it [is] … if you know U.S. history and your eyes are opened, you can’t [help] but [to] have developed a deeper commitment to anti-racism work. It’s [about] not having to convince people of something that’s not already there in the historical record. With the slave trade, white society often argued it was lifting ‘savages’ up from the ‘dark continent.’ Why wasn’t the true history of the African people told? So often, history is rewritten to serve the powerful. When Europe’s main contact with Africans was through a lucrative trade for both sides, there was no reason to distort the dignity of Africans and great African civilizations. Once enslavement based on race became profitable in the Americas, it was more necessary to justify the oppression by constructing false narratives of those who were enslaved. These justifications may have eased the conscience of some ‘owners,’ but it was also used to silence, or tamp down, abolitionist criticism. The project is aimed mainly at white people like yourself ‘who want to confront systemic racism more consistently and constructively.’ What has been the reaction of white readers so far? [I’m] sharing what I have taken from writers who happened to be black, and reflecting it back to those who might have a desire to do something but are either too tentative or too unconvinced. It’s not just a cursory matter. When you’re in conversation with someone, you see the body language and the discomfort. This is deeply emotional, it’s deeply bothering. Every individual is different. Why are you, as a white person, compelled to have this discussion about race? There are many reasons I got involved in this. The number-one reason is that such damage has been done. So much suffering has been caused by racism in the United States, both intended and unintentional. The center of this project are the lives of people today. When you look at Philadelphia, and you see what has happened in parts of this city, where the manufacturing base left 20 to 30 years ago, you see there is a high rate of crime and drug addiction. These things happened, but we don’t pay attention to the causes. We allow the racism to become embedded. Hugh Taft-Morales, leader of the Philadelphia Ethical Society. You have asked readers to pledge to ‘confront systemic racism more directly and take concrete steps to repair the harm done.’ Is that happening? The feedback I’m getting is positive, and that’s not surprising. People who have an issue with this, who say, ‘Why are you continuing to talk about this?’ are not coming to me. The people I’m hearing from are saying, ‘I didn’t know this,’ or, ‘I didn’t know that.’ Part of our problem is when people who are not aware learn how brutal the history has been and how racism has gotten new forms. It keeps reemerging in different ways that make it look race-neutral, [and] they begin to connect the dots. Most of the whites are surprised, but the people of color are not surprised. There is a website, 400years.today, where people can make their pledge to commit to anti-racism. What were some examples where racism reemerged in ‘race-neutral’ forms? After slavery ended, laws against loitering led to convict leasing. There were housing policies and redlining. When after-school centers are closed and nurses are removed from schools, we continued to take away resources from disempowered communities. Your project asks people to take action to repair the damage. How is the Ethical Society taking action? For the last 10 years or so, at least half of our annual assemblies have addressed some aspect of racial injustice or criminal justice reform. We’ve done a lot of our anti-racism work through our coalition group POWER [Philadelphians Organized to Witness Empower and Rebuild], the interfaith organization. Our [Philadelphia Ethical Society] office is in Rittenhouse Square, and it’s a very white area. It’s two blocks away from the Starbucks [at 18th and Locust, the site of the arrest of two black men last year]. And POWER used our office as a staging location for the protests. … But I can go down to the hotel lobbies and condos around the square, and most of the door people are people of color, and most of the people living in the buildings are white. We live in a society where the legacy of racism is alive and flourishing.